A trade-in influx may start in 2016 or earlier. SAN FRANCISCO -- Elon Musk, in his quest to transform Tesla Motors from a scrappy electric-vehicle startup into a mature, profitable automaker, may have an ace up his sleeve: used cars. Tesla is developing a program to sell the Model S secondhand, Automotive News has learned, in a bid to lower the cost of entry for the $71,070 sedan and unlock the earnings potential of Tesla's factory-owned retail network. Tesla's vice president of communications, Simon Sproule, confirmed that the company is developing a certified pre-owned program to compete with those offered by luxury brands such as BMW and Mercedes-Benz. "With the Model S fleet now heading toward the first cars hitting three years old," he wrote in an email, "we are looking at CPO and how best to structure." Tesla is racing against a clock that started ticking in April 2013, when Musk -- determined to reassure customers about buying an unproven electric car from a brand-new automaker -- personally guaranteed the resale value of the Model S.
Since then, buyers who financed a Model S under certain terms have been given a contract allowing them to return the car after three years and recover 43 to 50 percent of its sticker price. The payouts were designed to be comparable to the trade-in value of a 3-year-old German luxury car. "Even if Tesla is unable to honor [the buyback guarantee], I will personally do so," the founder and CEO, who is worth an estimated $10 billion, told reporters at the time. "That's what I mean by putting my money where my mouth is." If owners take up the offer, it would bring Tesla a steady stream of used Model S sedans starting in the spring of 2016, with many more to follow in 2017: Tesla, which has offered business leases since April, quietly started offering 36-month Model S leases to retail customers on Oct. 1, with offers starting at $5,000 down and $932 a month. The offer is available in 37 states. In an email, Sproule wrote that the new lease offer, combined with traditional loans and the resale value guarantee, "completes a suite of products ... that covers a comprehensive range of financing needs for Model S customers." Although records of private Model S sales are spotty, early signs indicate that the Model S sedans returning in 2016 will be worth more than what Tesla has promised to pay under the buyback program. The influx of trade-ins could start even earlier, when the Model X crossover arrives next year, giving early buyers of the Model S a chance to choose something different from the Tesla stable. Sales of used Model S sedans offer a potential bonanza for Tesla over the next few years. - June 2012: Tesla starts delivering the Model S sedan to customers. - April 2013: CEO Elon Musk guarantees the resale value of the Model S after 3 years, mimicking a lease deal. - April 2014: Tesla's finance arm starts offering 3-year business leases. - October 2014: Tesla's finance arm starts offering 3-year consumer leases. - June 2015: Model X crossover arrives, giving Model S owners their first chance to trade for something new in the Tesla stable. - April 2016: Cars covered by Musk's 3-year price guarantee become eligible for buyback. - April 2017: First batch of business leases expire, returning more cars to Tesla. - October 2017: First consumer leases expire, delivering more used cars. Under its retail strategy of selling through factory-owned stores rather than franchised dealers, Tesla has taken on the hefty cost of opening showrooms across the country and servicing its own vehicles. With a used-car program, Tesla will be able not only to reach a new segment of the market at a lower price point, but also to tap into the most lucrative part of the retail business. Used-car departments at U.S. dealerships averaged a 12 percent profit margin in 2013, triple the profit of new-car departments, according to data from the National Automobile Dealers Association. "When you have a manufacturer-controlled retail network, you're capturing all of the profit with each sale," John Krafcik, president of the online car-buying service TrueCar Inc., said in an interview. "The upside is pretty amazing for Tesla." Carmax Inc., the nation's largest used-car retailer, earned $2,220 per used vehicle in its fiscal first quarter ended May 31, an 11 percent margin. Krafcik, citing analysis by TrueCar affiliate ALG, said it is possible that Tesla will earn more profit on a second purchase than the first, making $6,000 to $10,000 for each used Model S that it sells. "That's a pretty extraordinary margin, and it is pure margin," Krafcik said. "It's really unlike anything we've seen in the industry." These sorts of earnings would be a bonanza for Tesla, which, 11 years after its formation, has delivered just one profitable quarter and has yet to turn in an annual profit. Held back by r&d expenses, Tesla reported losses of $62 million in the second quarter of 2014 despite assembling and delivering a record number of vehicles. Gearing up to refurbish and sell used cars will require major outlays, too, said David Whiston, an analyst at Morningstar Inc. who tracks Tesla's stock. Tesla also may need to jump through legal hoops to become a used-car retailer, mirroring its state-by-state clashes with franchised new-car dealers that dislike Tesla's direct-sales strategy. And Tesla runs the risk that the Model S won't hold its value as well as expected, either because of durability problems or fading consumer demand. To help manage these risks in the future, Tesla has bolstered its finance team, hiring seasoned veterans such as Reddy Pakanati, the longtime chief risk officer for Toyota's U.S. lending arm. "This is going to cost Tesla money upfront," Whiston said of the future used-car program. "You've got to get more staff, and you've also got to get real estate because you need to have somewhere to service and store these cars. But if [resale] values continue to hold up, they will be in a very unique and advantageous position." The lingering unknown for Tesla is what it will be able to charge for a used Model S.
According to the ALG analysis cited by Krafcik, the Model S is losing 20 to 25 percent of its value in the first year after sale, compared with 35 percent for the Mercedes-Benz S class, which was benchmarked for the buyback guarantee program. Another analysis, released in February by the car-shopping website iSeeCars.com, found that the average sale of a used Model S was $99,734 -- close to the average transaction price for a new Model S, which is above $100,000. But these secondhand sales are few and far between. The NADA Used Car Guide, which gathers pricing data on 80 percent of cars sold at auction in the U.S., has records on just 26 Model S sales since February, said Larry Dixon, the guide's senior manager of market intelligence. Dixon said he wasn't confident that the Model S would command high resale values, pointing out that trendy new vehicles often carry a premium when they first enter the used-car market, then tail off. "Just look at the PT Cruiser or the Ford Thunderbird," Dixon said. "These cars are in high demand early on, but the rate of depreciation quickly accelerates once supply gets to the market and that pool of early used-car adopters has dried up." Sellers have other options. If they find Tesla's trade-in offer too low, they could try selling a Model S privately or to a used-car dealer. But this may be harder than it sounds, Dixon said. Other dealers may not feel comfortable marketing Tesla's electric powertrain, and buyers may not be willing to pay as much for a used EV if it isn't certified by Tesla. The initial rollout will inevitably create showroom challenges, Krafcik said. If a buyer can get a brand-new Model III -- the lower-priced Tesla due in 2017 -- for $40,000, with features not available on the Model S, would that customer be willing to buy a 3-year-old Model S for $10,000 or $20,000 more? 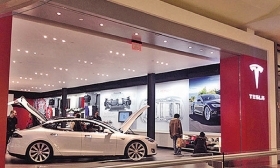 In the long run, Krafcik said, a CPO program is a must-have for Tesla, given its ability to profit on the second or third sale of the same car. "They'll definitely have a strong CPO program," he said. "It makes all the sense in the world."